Gail is a native to Alexandria, Minnesota and now resides in Southwest Minneapolis. She grew up and graduated from Alex, as did her brother, Jim, and sister, Jana. Her parents, Phil and Jeannine, were elementary school teachers in the area until they retired. Gail began Joyful H’Arts Studio as a way to spread the joy of painting and crafting to students with the hope that it will provide the same peace and therapeutic benefits that she has enjoyed. While trying to diagnose a period of seizures in her life which began in 2010, Gail discovered a love of painting that she never knew existed. Now the seizures are under control and Joyful H’Arts Studio was born from the experience! Her unique style of instruction creates a fun and relaxed atmosphere for all skill levels…especially beginners! 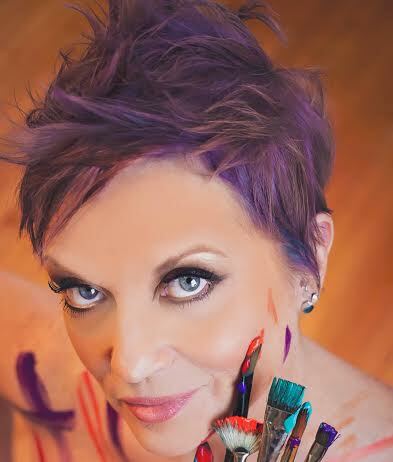 She assures you that she’s the “paint whisperer” and can help you discover creativity. If she could find her creative side after age 50, she’s sure that there’s one hiding in you as well! Gail emphasizes that her classes are “fun” art rather than “fine” art classes and hopes that you will enjoy the social experience of the class rather than stressing over technique. A good dose of hilarity is often known to happen in her classes as well, so be ready! Come prepared to relax, let the stress of the day melt off of you, and create a beautiful painting or craft art project while you’re at it! See the Gallery (Choose your Painting or Project) for paintings and projects offered.